The Screaming Pope: Parma Journal: What is a Charterhouse Anyway? When you enter the Parma train station, you might think of Stendhal before you conjure images of a piping hot veal dish covered with cheese (that has little to do with the cuisine of the city or region) or even the artist Parmigianino (who was born there). The famous novel that’s named after the city and deals with a nobleman named Fabrizio del Dongo, is set in the Napoleonic era. And what the hell is a charterhouse? What you have is another Northern Italian city that bears few signs of nobility. Like a lot of things, a visit to Parma requires an archeological impulse. You have to look for the history underneath the urbanization and industrialization. You had expected that Parma, the next stop on the line after Reggio Emilia would be a tiny little estuary, something out of a nineteenth century novel where veterans from varying campaigns arrived in horse drawn carriages to nurse their wounds within a class structure that created a kind of Internationale for nobles. Instead the station is a bustling affair filled with immigrants from countries that even a worldly fellow like Stendhal wouldn’t have heard about. 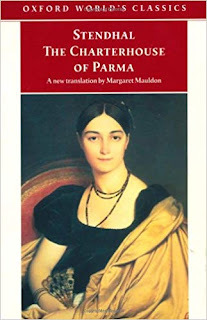 But it's interesting to think about unleashing the sensibility of Stendhal on this new Northern Italian reality and see how the great French writer would have dealt with the current cast of characters who have taken up residence in Parma and what their discussions about the nature of human life would sound like. In 1877, 38 years after Stendhal wrote his Charterhouse, Pietro Barilla opened a bake shop in Parma that would eventually become a global pasta business.